Fact: Tim Burton is crazy. From movies like Big Fish to Edward Scissorhands, Burton has a distinct style that has been displayed on the silver screen for over two decades. He brings his vision to Disney’s update and sequel Alice in Wonderland. Starring Burton’s usual crew of Johnny Depp (Sweeney Todd: The Demon Barber of Fleet Street), Helena Bonham Carter (Harry Potter and the Half-Blood Prince), and others. Introduced in the film is Mia Wasikowska as Alice, who portrays the character wonderfully. The situation this time leads Alice back to Wonderland because she is needed by the White Queen (Anne Hathaway, The Princess Diaries) to help kill the Jabberwocky. However, Alice doesn’t remember being in Wonderland before, thinking this (and the previous time) are all part of a dream. But when Alice realizes the Red Queen (Carter) is about ready to take over Wonderland for good, Alice does decide to help out. 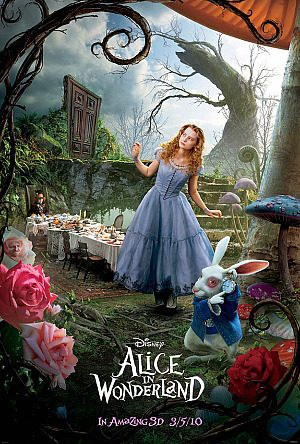 Without ruining too many of the details, Alice reunites with Hatter (Depp) who tries to help Alice remember everything she went through her first time around so she believes that Wonderland is real. Once the Hatter is caught, Alice kicks it into high gear. She poses as a friend of the Red Queen and starts to step in the right path to kill the Jabberwocky. Overall, the film is pretty good. While it is a bit long for a Disney movie (running 109 minutes), the film never seems to drag on. Burton creates an overall beautiful depiction of Wonderland (in some aspects), while keeping action, suspense, and humor high. The only recommendation I have for the viewer is to make sure to see the movie in 3D or at IMAX. You’ll surely be missing out if you don’t.